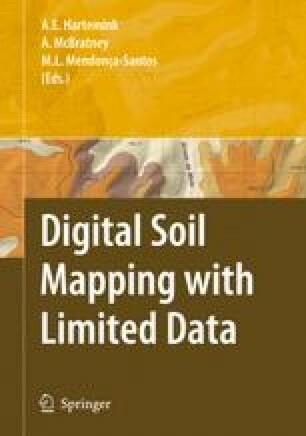 Digital soil mapping requires two basic pieces of information: spatial information on the environmental conditions which co-vary with the soil conditions and the information on relationship between the set of environment covariates and soil conditions. The former falls into the category of GIS/remote sensing analysis. The latter is often obtained through extensive field sampling. Extensive field sampling is very labor intensive and costly. It is particularly problematic for areas with limited data. This chapter explores a purposive sampling approach to improve the efficiency of field sampling for digital soil mapping. We believe that unique soil conditions (soil types or soil properties) can be associated with unique combination (configuration) of environmental conditions. We used the fuzzy c-means classification to identify these unique combinations and their spatial locations. Field sampling efforts were then allocated to investigate the soil at the typical locations of these combinations for establishing the relationships between soil conditions and environmental conditions. The established relationships were then used to map the spatial distribution of soil conditions. A case study in China using this approach showed that this approach was effective for digital soil mapping with limited data.